Invisalign® is a way to straighten crooked teeth without the traditional metal bars and brackets of braces. This modern, revolutionary approach to orthodontic services uses custom made aligner trays that gradually shift your teeth into place. This comfortable, clear, and discreet teeth straightening method moves your teeth over time without the pain of traditional braces. Every two weeks, you replace your aligner trays with new ones until your treatment is complete and you are left with a beautiful, confident smile. After your doctor evaluates your mouth and determines if you are a good candidate for Invisalign® orthodontic services, you will have x-rays taken and impressions of your teeth made. From these x-rays and impressions, a digital 3-D image is often generated which allows your doctor the ability to map out a teeth straightening treatment plan for the movement of your teeth. From these 3-D images, your clear, custom made aligner trays are fabricated specifically for you. You will wear them throughout the day and night, removing them only to eat and clean your teeth. Over time, the aligner trays gradually move your teeth into position. Approximately every two weeks your aligner trays are replaced, advancing you to the next stage of treatment. Every six to eight weeks you will have checkups with your doctor to monitor the results. The length of teeth straightening treatment varies, but usually lasts up to a year. • The aligner trays are removable, so you can easily eat without the limitations of traditional braces. • Invisalign® is discreet. The trays are nearly invisible and most people will not even know you are wearing them. • You can easily remove the aligner trays to clean them as well as your teeth. Maintaining good oral hygiene is the same as if you were not undergoing orthodontic services. • The aligner trays are smooth and comfortable with little to no irritation. 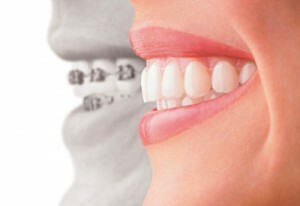 • You will get a beautiful, confident smile without the complications of wearing metal braces. Invisalign® orthodontic services are an easy, convenient teeth straightening method. Call us today to schedule your Invisalign® consultation.